Let's take a time out on the smoking issues of Rare Earth and Lynas, and take a look at updates on New Gadgets. Ok, you've been deceived, well just a little. 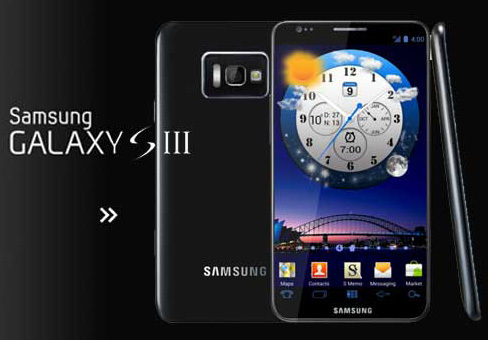 The new Samsung Galaxy S3 is not yet out. But here is an interesting possibility of its imminent launch. By the way the S3 is of particular interest as my better half is currently using Galaxy S2 and she may want to check this one out. Work of the rumour millers. With Mobile World Congress (MWC) over now and nothing happened, the rumour mill will probably be shifting to higher gears once more. It was understood that Samsung performed very well during the recent MWC with some great devices. In Korea, check out what ZDNet said and the S3 would probably be launched in April, with London and the UK one of the initial launch markets. This would be best timed for this year's Olympic Games. Note that Samsung is an official partner of the games. 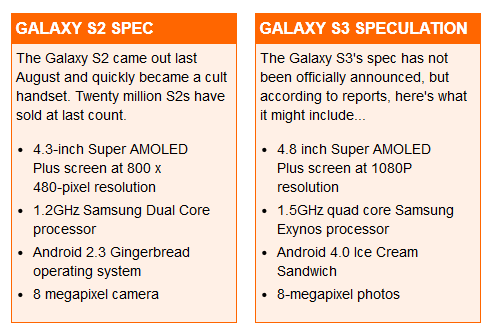 The Galaxy S3 would be powered by a 1.5-GHz quad-core Samsung Exynos CPU, with Android 4.0 Ice Cream Sandwich available out of the box. A possible full edge-to-edge HD screen measuring 4.8 inches ans the option to choose from 32 GB or 64 GB internal storage. A big 2 GB of internal memory and an 8MP camera. Comparing the S2 and S3, but no promise, just hope. Lets see if Galaxy S3 fans would be sorely disappointed as did iPhone fans with the eventual release of the 4S instead of 5. For the hopefuls' reading pleasure. Samsung is going to set the bar very high with a thinner phone making it further competitive compared to iPhone 4S. The 4S is currently thicker than the S2. As for dimensions and weight, no single rumour miller has provided any information so far, or at least I haven't seen any on the Internet yet. The Galaxy S3 is going to attract a lot of iPhone fans and it will come in no surprise if the rumoured features become reality. Moreover, iPhone 5 (or whatever they may call it) is still many months away from possible launch. Nak beli satu lah pas ni ekeke..